Ciara Rossiter of Wexford Youths Women's AFC was selected as the Young Player of the Year at the Continental Tyres Women's National League Player of the Year awards. The awards were presented at the special luncheon in the Clyde Court Hotel, Dublin, which was attended by players and representatives from all seven Continental Tyres Women's National League clubs. The awards were presented by Eamon Naughton, Chairman of the Women's National League Committee and Peter Robb, Marketing Communications Manager, Continental Tyre Group. The players on the Continental Tyres Women's National League Team of the Season also received their awards with six of the eleven places going to players from newly crowned champions Wexford Youths Women's AFC. Raheny United, UCD Waves and Galway WFC were also represented on the team. The Golden Boot Award, which is presented by the Irish Daily Mail, won't be presented until after the final league games on May 3 as O'Gorman with 22 goals and Raheny United's Katie McCabe with 24 are neck and neck in the goalscoring chart. Pauline O'Shaughnessy, the long-serving secretary of the Women's Football Association of Ireland, received the Services to Football Award for her contribution to the game over the past 30 years in many different roles. This season's Continental Tyres Women's National League was won for the first time by Wexford Youths Women's AFC and the 2015 Continental Tyres WNL Cup Final between Peamount United and Raheny United will take place on Sunday, April 26, at Tolka Park with a kick-off time of 4.30pm. 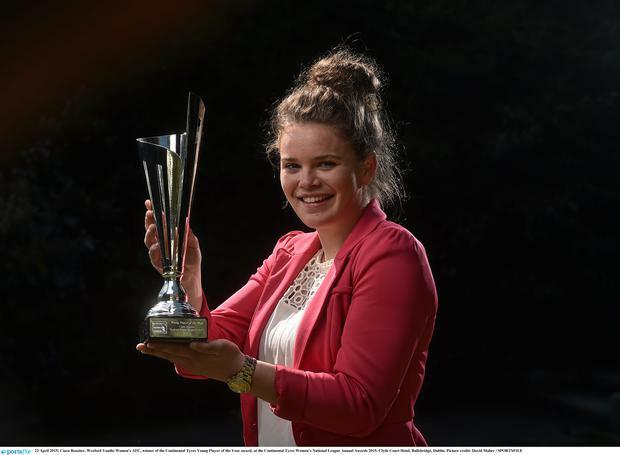 Continental Tyres Services to Women's Football Award: Pauline O'Shaughnessy (WFAI).